Luckily for the Seahawks, they have a player that has gotten nothing but better at pulling off the play-action the past few seasons, that being Russell Wilson. The QB is mentioned in an article by Sports Illustrated – The NFL’s Hidden Talents: Best play-action quarterbacks. Wilson has used play-action as much as any quarterback in the league since his rookie year in 2012, when he play-faked on 37.8% of his passing attempts. That rate dropped to 33.8 in 2013 and 30.4 in 2014, but with his ability to roll out and escape pressure, combined with Marshawn Lynch’s power and productivity, Wilson is very tough to stop when he shows run. Last season, he threw for seven touchdowns and three picks in 193 play-action attempts, as opposed to 19 touchdowns and nine picks in 441 attempts without play-action. The Seahawks do things a bit differently, though. They run a ton of inside zone and base a lot of their option game off that, where Wilson has the choice to either hand the ball to Lynch, run it outside himself or roll out for a pass to an open receiver. One of the favorite plays in offensive coordinator Darrell Bevell’s playbook sets Wilson up to roll right out of play-action, forcing the defense to either follow the back or the moving quarterback. When the back flares out for a route against the flow of the play, the attention is usually turned away from him. 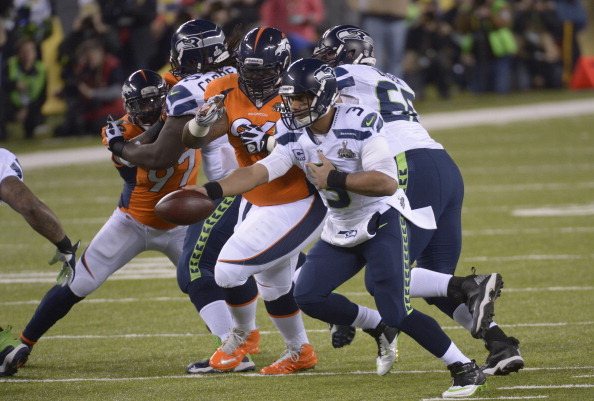 That’s when Wilson will reset and throw to Lynch, as he did on this touchdown against the Eagles in Week 14. It’s a solid article that talks in-depth about the lost art in the league, and while Luck is on the list for his ability to produce magic, fellow QB’s that make the list include: Andrew Luck of the Colts, Ben Roethlisberger of the Steeers, Philip Rivers of the Chargers and Eli Manning of the NY Giants.